Later this month, Molton Brown will launch Geranium Nefertum, a new unisex fragrance. 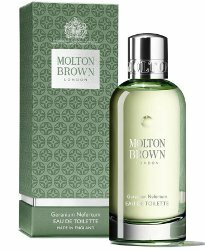 Molton Brown Geranium Nefertum will be available in 50 and 100 ml Eau de Toilette and in matching body products. I will definitely put this on my sniff list. Sounds great! There’s a shop close by my house that carrys that line , I hope they get it soon! I was just going to Fragrantica & basenotes sites to search for geranium perfumes! How funny, I stopped here first as I hadn’t checked in today yet! Oh I love geranium and mint! I’m having a hard time “picturing” what this smells like–I’ll have to seek it out.